CPF 200 Series Fibers are composite blends of acrylic materials which are less fibrillated, lower cost alternatives to CFF V110-1 and are used for preform strength in non asbestos disc pad and truck block applications. They are used mainly in formulations that may be easier to preform than standard formulations. 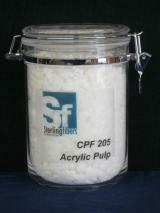 CPF 200 Series products are chemically identical to CFF V110-1 pulp.